You might think you have gravity pretty well figured out. If you drop a ball out of a window, a short time later it will hit the ground. The higher up you drop it, the faster it travels before it hits the ground. But something far more profound is going on, and it’s nicely illustrated by the image you see above. Albert Einstein published his theory of general relativity back in 1915, and it’s now the agreed-upon math that describes gravity. A few of its key assumptions are that that all of space exists not in three dimensions, but as four-dimensional spacetime. Light traveling unimpeded always moves the same speed in this spacetime, and physics is always the same when things aren’t accelerating. In order for Einstein’s theory to work, anything with energy must literally change spacetime’s shape, thus changing the effects of gravity. There are few things that paint this picture better than the Einstein Ring. A gorgeous example of this phenomenon was recently imaged by the Hubble Space Telescope. At the middle of the image, you can see two bright lights—this is actually a cluster of hundreds of galaxies called SDSS J0146-0929. The red ring is actually galaxies, too. Except the background galaxies’ light had to travel through space that was heavily warped by the massive cluster in the foreground. This creates multiple warped images of the background galaxies, as if a piece of curved glass traveled in front of them. 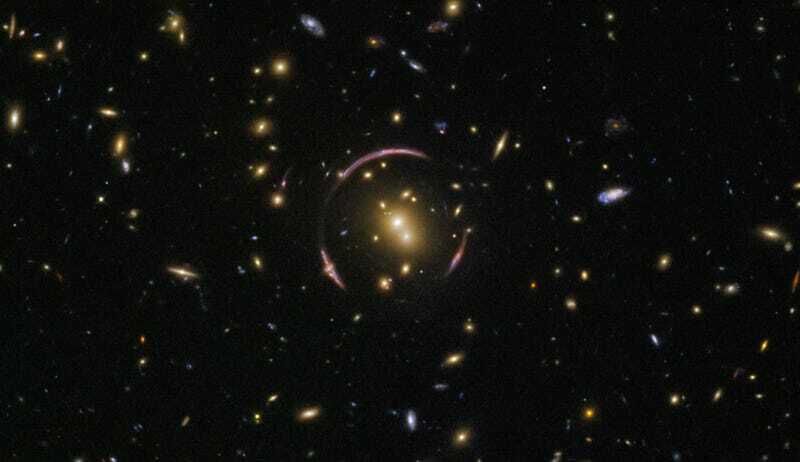 Gravitational lensing isn’t just cool though—it’s become an important tool for astronomers. Scientists recently proved that they could measure the mass of a star using the way it bent the light of the stars behind it—something Einstein himself thought impossible. Gravitational lensing revealed the oldest spiral galaxy on record. One galaxy magnified a star behind it by nearly 2,000 times—that star is now one of the most distant single stars ever observed. In this case, the image doesn’t seem to contain any textbook-shattering revelations. But it’s pretty amazing to see one of the most elegant theories in all of physics presented so clearly.